Camper's The FOODBALL menu. It's all balls! Rice balls. Chicken, tofu and seaweed, all organic, all delicious, and all derived from the Catlunian rice ball tapas. You may recognise the Marti Guixe signature font? He was the designer and culinary advisor of this Catalunian shoemakers flagship tapas bar. 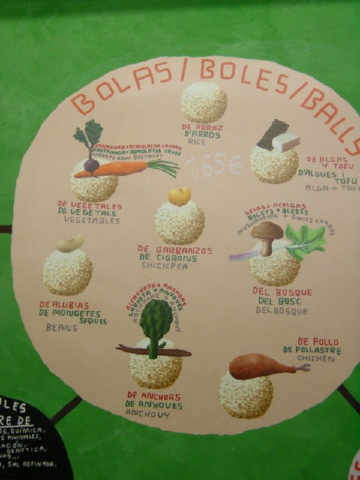 Balls are something of a leitmotif in Marti G's gastro-design.